One of our favorite recent projects was actually an eDesign, with the majority of the design work done remotely. We started with pieces readily available through major retailers, tossed in a few custom items and even a little Ikea hack, and ended up loving the result! Since we’ve gotten so many questions about the space we wanted to share some information and sources. We began with a fresh coat of paint, using a blend of Benjamin Moore's Linen White and Decorator's White for a warm but bright background. We recommended natural fiber rugs, a slipcovered sleeper sofa and fresh white bedding for a casual, beachy feel. Sofa | Ottoman | Pillows are custom using Galbraith & Paul and Quadrille fabrics, available through us. The space on either side of the bed was very tight so we knew we needed really narrow nightstands. The clients were up for a little DIY Ikea magic, and ended up with these beauties! We started with inexpensive Ikea nightstands, added a coat of Benjamin Moore Palladian Blue in gloss and finished with fun brass knobs. The clients needed a place for guests to eat but lacked space for a full table. We thought this small console table and stools solved the problem quite nicely! We've had the chance to use wallpaper in many of our recent projects, and have been so happy with the results that we just had to share! Whether it's a bold geometric pattern or a fun print, wallpaper is a great way to make an impact in just about any space. Small spaces like powder rooms are perfect for bold prints! These rooms are often windowless and are instantly brightened with a patterned wall. 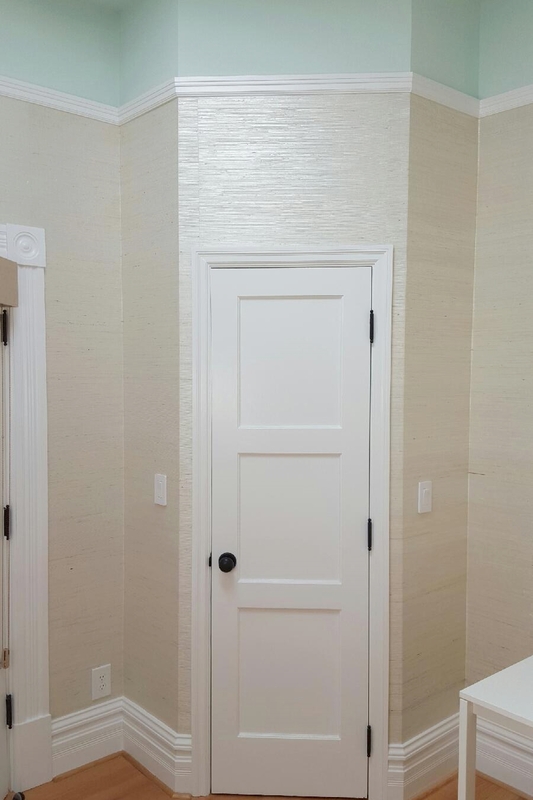 Adding a patterned grass cloth to the back wall helped define and create an entry space in this open concept home. Nurseries are another favorite space for wallpaper. It was fun to go bold with the girly magnolia print, and we also love how the subtle pattern on the ceiling of this nursery turned out. You can't go wrong with grasscloth! We used vinyl for a client's master bath to add texture that could stand up to heat and steam, and a bit of shimmer to play up the fun angles in the little nursery above. Desk Roundup, something for every budget! We've been doing so many home offices lately we thought it would be a great time to share a few of our favorite desk options out there. So here is a quick roundup of some we've used, some you might see in upcoming project photos & anything else that has caught our eye! We always love a good before and after! Who Doesn't?! One of our favorites right now is this sunny Noe Valley breakfast nook that was prime real estate in the home but needed a little help to make it more inviting and comfortable. We've always been a huge fan of Galbraith & Paul fabrics, especially their lotus pattern which has made an appearance in a couple projects now. In this case it was just the right size for the backs of some louis dining chairs we had custom made for clients in menlo park. We're Excited for the upcoming photo shoot next week! One of my favorite things from a recent trip to India was seeing so many beautiful and sometimes incredibly detailed tile designs. Even the simplest patterns still had such a lovely geometry to them. But of course another favorite would have to be the shopping! It's so much fun to find unique pieces to bring back for projects. And part of the fun is just waiting to see where something will end up. This beautiful pearl inlay table already had a client waiting for it! And always handy to have a little secret storage. Now time to decide where the next trip will be! With summer just around the corner, we are thinking of barbeques, warm evenings and time spent outdoors. Which leads us to think about outdoor pillows! There’s something so nice about dressing up an outdoor sofa or chair with a bright patterned pillow, and options abound this season. Here are some of our top picks. We’ve found that sometimes the perfect piece of furniture doesn’t exist and getting a custom piece made can be a great alternative. Recently clients fell in love with a set of chairs only to find that they were no longer available. Solution? Have them made and make them even better! From a shop drawing to a frame. Then upholstered with a durable, kid-friendly grey contract grade velvet. Voila! A beautiful pair of chairs ready to be delivered to their new home.